Recorre el paisaje escarpado del desfiladero del Tajo de Ronda en un tour en 4x4 en auto-manejo. Prepárese para ensuciarse en este recorrido por territorio off-road al que la mayoría de los vehículos comunes no pueden acceder. En la pista de 15.5 millas (25 kilómetros), parará en una parte del casco antiguo, verá la antigua plaza de toros y obtendrá vistas épicas de la garganta antes de descender. Imágenes y fotos de GoPro disponibles para descargar. El recorrido de 15.5 millas (25 kilómetros) atraviesa el casco histórico y se adentra en el desfiladero. Todo el equipo e instrucción incluidos. Uso de cámaras GoPro; Fotos y videos disponibles después de la gira. Had a fun time. Host was very helpful and fun. We especially enjoyed the river crossing and great views of Ronda. We were in Ronda on a dreary day and this made the touring the city and gorge so much more fun, than trudging through in the rain. We went the through the mountain area, saw wild boar and goat. Then toured through the town across the top of the bridge and down to the bottom of the gorge for a view from the bottom. Great way to see Ronda! The Ronda gorge buggy tour was absolutely amazing! We had so much fun driving through the snow in the higher hills and saw some fantastic views of the city, bridge and sunset. Would highly recommend fr anyone looking for an adventure and lots of laughter. Beautiful scenery, friendly staff. Overall fun experience! We enjoyed the Buggy Tour - the guys definitely enjoyed driving the buggies. A great way to spend a few hours. The tour operators where friendly and you knew they wanted you to enjoy the experience. Recommend. This was an excellent day! 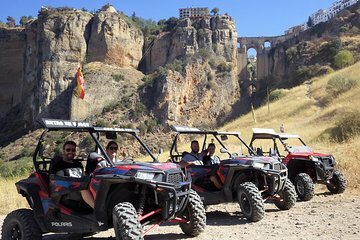 The dune buggy trip was a fun, relaxed way to see beautiful Ronda. The service was great and we had a lot of time to take the pictures we wanted. This is a must do for anyone travelling to Ronda! Great tour, buggies were fine and easy to drive, it was a good ride around the city and up into the main square. The one downpoint - we never got the promised link for the GoPro images.